Be the first to share your favorite memory, photo or story of Robert "Bob". This memorial page is dedicated for family, friends and future generations to celebrate the life of their loved one. Mr. Robert C. "Bob" Hees, 80, of New Canton, Illinois, passed away at 8:15 a.m. Saturday, September 15, 2018, at his home. He was born January 17, 1938, in Pleasant Vale Township, Pike County, Illinois, to Robert B. & Dorothy (Allensworth) Hees. They preceded him in death. He married Judith Ann "Judy" Bowker on May 29, 1959, in rural New Canton, Illinois. She preceded him in death on January 17, 2018. He is survived by 1 daughter Kim L. Sigler, husband Robert, of Rural Barry; 3 grandchildren, Randi Nichole Kindhart, husband Eric, of New Canton; Annie Rose Pipes, husband Kyle, of New Canton & Robert Cole Sigler, of New Canton; 2 great grandchildren, Isabella Grace Kindhart of New Canton and Owen Dean Kindhart, of New Canton; and 1 sister Patricia Smith of Camden, New York. In addition to his parents and his wife Judy, Bob was also preceded in death by 1 son Randy D. Hees. Bob was a loving husband, father, and grandfather. In earlier years, Bob loved riding motorcycles, boating and going dancing with his wife, Judy. He owned Hees Automotive and Welding in New Canton, Illinois. 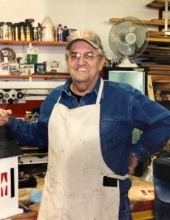 In recent years, he enjoyed working in his wood shop and spending time with his family. Visitation will be from 4:00 - 7:00 p.m. Wednesday, September 19, 2018, at the Kirgan Funeral Home in Barry. Graveside Services will be at 11:00 a.m. Thursday, September 20, 2018, at Shearer Cemetery in New Canton. Burial will be in Shearer Cemetery in New Canton. Memorials are suggested to the Barry Community Care Center Activity Fund. To send flowers or a remembrance gift to the family of Robert "Bob" C. Hees, please visit our Tribute Store. "Email Address" would like to share the life celebration of Robert "Bob" C. Hees. Click on the "link" to go to share a favorite memory or leave a condolence message for the family.